If you’re looking for a vibrant and colorful kind of garden this summer, try to grow some clusters of cosmos flowers. They are ridiculously easy to grow without any exhaustive commitment of relentless caring and support. The daisy-like flowers come in a variety of enchanting bright colors with attractive feathery leaves. These flowers make great garden ensembles as well as cut flowers. The word cosmos is derived from the Greek, which means orderly. Often associated with peace and tranquility, cosmos flower meaning is highly referred to as anxiety suppressant kind of flower. Aforementioned that the flowers are analogous to daisies, their flower-heads are mostly shallow open-cup shaped with series of colorful florets that surround a center disc. The blooms sit atop long slender stems where deeply lobed and feathery leaves grow. These flowers are available in an array of color including, yellow, orange, red, magenta, pink, white, and many more. Why Should We Grow Cosmos Flowers? There are reasons that make these Mexican asters, also called as cosmos bipinnatus, worth a look. Here are some reasons worth to mention to. Not only are cosmos flowers extremely easy to grow, but they also very beneficial for your overall garden situation. As much as we love cosmos blooms, many pollinators do too. The bloomed flowers produce nectar where bees and butterflies love to come over. Some pest-managing insects such as lacewings, parasite wasps, tachinid flies and hoverflies are also attracted to these flowers. With these beneficial insects hover around, they help provide a free pollination service to your garden. What can be better than an easy to grow a plant? A self-germinate plant for sure! 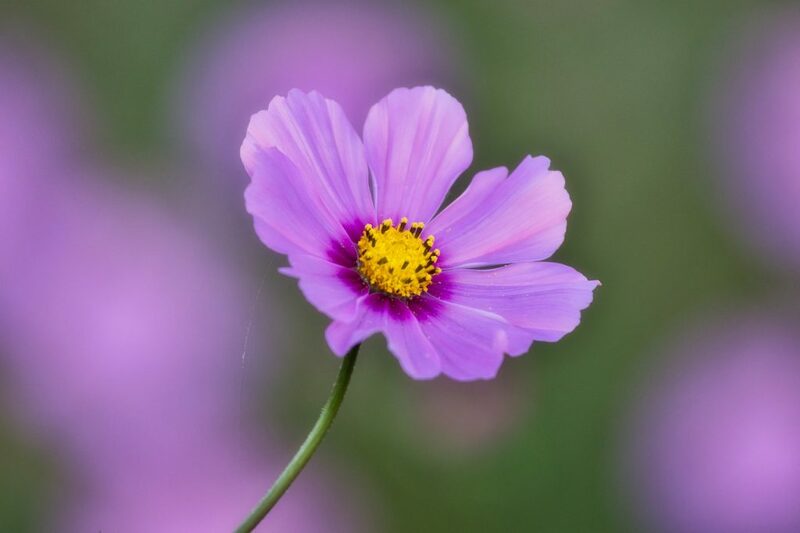 Besides their ability to grow in a hot and dry climate, they can self-sow once cosmos seeds are mature. All you need to do is waiting for the cosmos plants to die naturally. The withered flowers will fall onto the ground where eventually the seeds can germinate by themselves. 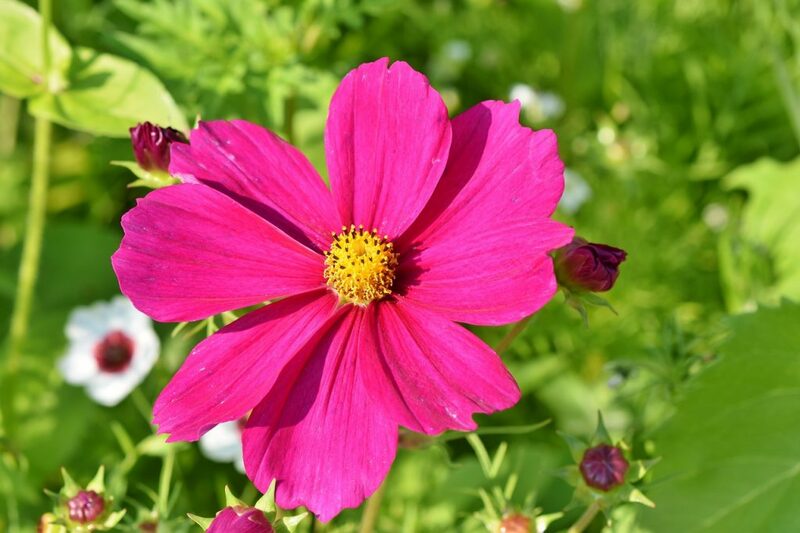 Both varieties of annual and perennial cosmos flowers can produce blooms that last for many months; again with relatively less effort to sustain the plants. When you feel like adding some zest of untraditional taste into your salad, try some cosmos flowers. These will surely add some extra texture and color to your plate. However, it is worth noting that only Cosmos sulphureus are edible. Besides, always opt for chemical free and organically cultivated ones before savoring those pretty petals. 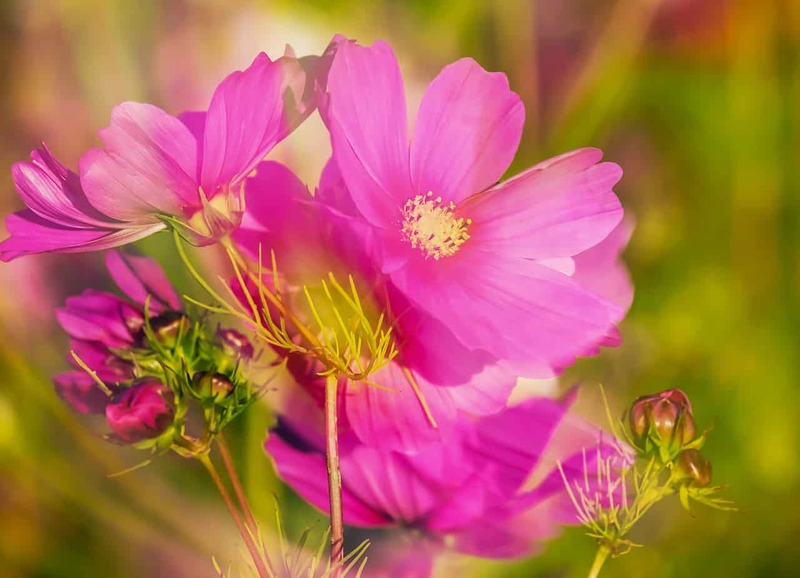 It is true that cosmos can self-sow and need little maintenance. However, it doesn’t mean that cosmos plants do not need any prerequisites or follow certain phases before they become such ornamental beauties to your gardens. A right soil condition and a proper sowing and planting procedure will ensure them to successfully grow and produce the best blooms. The best soil pH for cosmos to grow ranges between 6.0 and 6.8. 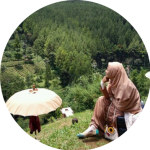 However, it doesn’t necessarily mean that they cannot live in other soil acidity level. In fact, they can survive almost all soil conditions. 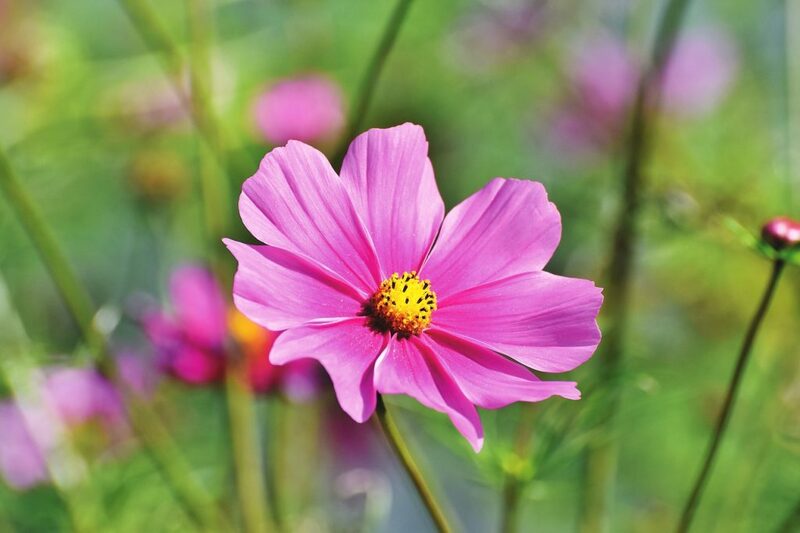 Just make sure to avoid too rich soil condition, as it will affect cosmos to produce fewer blooms and grow thinner. The best time to start sowing them is between 4 and 6 weeks before the last frost. This will require you to seed them indoors, though. Leaving winter, when all the frosts have gone, you can start to plant them outdoors. Direct seed outdoors on early spring is also preferable as it can catch up quickly with those sown indoors. Growing cosmos will go even smoother by paying attention to these caring tips. First, put them in full sun exposure. Cosmos need a lot of sun exposure in order to produce abundant blooms. Planting them in partially shaded areas is okay. However, they will grow scragglier with fewer blooms to produce. Second, deadheading is key to prolong the blooming season. Having the buds blooms at different times, it is important to remove spent flowers from the plant – deadheading. This will allow the plant to distribute its energy to support the remaining buds to bloom instead of supporting the dead flower to seed. Another caring tip is especially applied for tall varieties of cosmos. It is suggested to plant them near other plants to provide support for the stems. Or, you can create some type of staking to avoid the cosmos plants from flopping over. Things related to fertilizing or watering the plant do not require any extra attentions. These plants can handle poor soil condition and survive from drought. In fact, over-fertilizing and over-watering can reduce the bloom production. These flowers usually are white with a distinctively vibrant crimson border around the edge of the petals. Cosmos Sea Shells series are characterized by ruffled, rolled sea shells-like petals. Some popular cosmos Sea Shells blends include white and pink cosmos. The fun and playful series contain a blend of red, orange, and rich yellow cosmos. The exuberant orange cosmos that can handle drought very well. This deep red cosmos variety is characterized by the chocolaty smell it has. These chocolate cosmos flowers are perennials and tend to need more doting supervision than the annual cosmos. Purity series come in crisp white petals with bright yellowy to orangey center discs. These white cosmos varieties are double layered; making them look more voluminous than single layered varieties. The white cosmos varieties with a sweet pinkish zone around the center discs. These series are often called dwarf cosmos, referring to their short and petite size. Planting these varieties along with other types of flowers such as dahlias and cannas will turn your garden more colorful throughout the summer. Choose any varieties you like and enjoy having a laid-back summer garden with less caring and maintenance.